Trinity Church By-the Sea supports the following local organizations through donations of money, volunteer time and needed items. We encourage you to learn more about these organizations and to join us in supporting them in whatever ways you can. 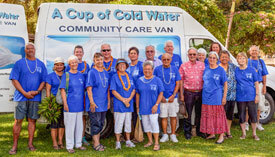 A Cup of Cold Water (ACCW) is a community Care-Van outreach program on the island of Maui, formed by a group of committed Episcopalians from Good Shepherd, Holy Innocents, St. John’s and Trinity By-the-Sea churches. The program is a food and clothing distribution service for the poor and needy in the community, and uses the care-van to deliver essential food, hygiene and clothing items throughout the island. With a strong volunteer base from the Episcopal Churches on Maui, the program is growing and now includes churches from various denominations. For more information and to help or donate to this program, contact Keku Akana, ACCW Board President, or Mary Lou Mellinger, by email or phone at 808-419-1637. Additional information available at the Diocesan Website. 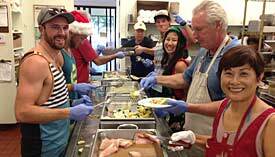 Founded by a diverse group of South Maui individuals in August of 1991, these founders decided to build upon an unnamed, but very active, meal program serving the hungry. Hale Kau Kau still continues this service today at Saint Theresa Church. Every night of the year Hale Kau Kau serves hot, nutritious meals at their kitchen located at Saint Theresa Church as well as delivering meals to homebound elderly, ill and/or disabled clients. They also distribute food baskets and emergency supplies to families in crisis on a monthly basis. Learn more at http://halekaukau.org. Since 1977, what began as a grassroots effort to provide assistance and support for women victims of domestic violence, Women Helping Women has steadily grown to become an established non-profit agency that provides a comprehensive continuum of services to over 600 women, men, and children each year. WHW provides a variety of projects, programs and activities focused on direct intervention, advocacy, education and prevention. Today, Women Helping Women supports a staff of over 20 dedicated professionals, with offices in West Maui and on Lanai.